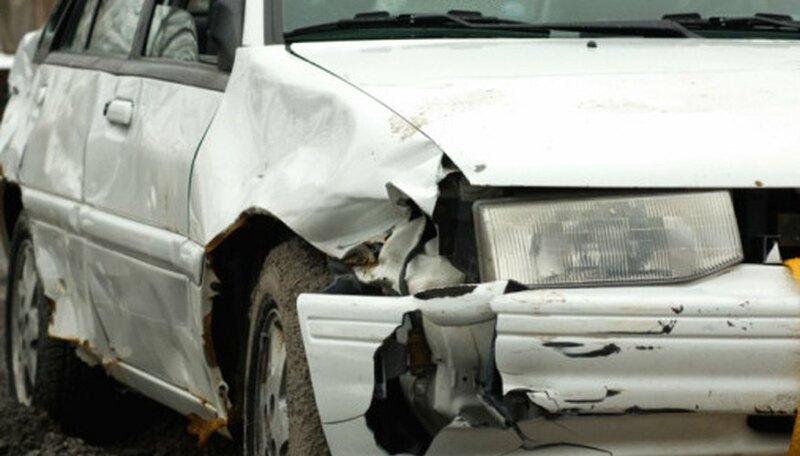 A vehicle running into something solid will suffer crush damage as its forward motion suddenly stops. The energy being created by the speed of the vehicle is absorbed by the body of the vehicle. The faster it goes, the greater the amount of energy to be absorbed, and therefore the greater the crush damage. The study of crush damage has enabled scientists to work out the speed at which damaged vehicles were traveling at the moment of impact, providing an additional source of data for accident reconstruction analysis. In the following procedure, an aluminum can replaces the vehicle. But the same principle applies. Drop a heavy object directly onto the top of the can. Trace the outline of the crushed can next to the first tracing, with the base of the can on the same line. Measure the difference in height between the two cans to find the crush depth. Apply the Crush Factor Formula to calculate the speed of the falling weight. First, multiply the crush depth by the “crush factor.” This is a value based on statistical analysis of 1,000 accidents. It is available as a table (see References). Multiply this figure by 30. Find the square root of the total figure and this will give the speed of the vehicle at the point of impact. The weight dropped on the can must hit it squarely. The weight and height it falls must be sufficient to cause measurable damage to the can. Staples, Peter. "How to Calculate Speed by Crush." Sciencing, https://sciencing.com/calculate-speed-crush-8624674.html. 25 April 2017.